There are few issues more controversial in Canada and around the world than the annual seal hunt that takes place in the waters and on the ice floes off Atlantic Canada. The bloody images, the heated rhetoric, the impassioned defences all combine in a familiar rite that pits governments and sealers against animal rights groups. So begins an article on CBC.ca . For years now the Canadian seal hunt has pissed off people around the world - including attention-seeking pop-star Paul McCartney and his ex-wife, the one-legged model (she said she was anti-sealing, but she didn't have a leg to stand on) - and groups from PETA (Putzes for the Ethical Treatment of Animals) to Greenpeace to the European Union. But not so fast Dudley Do-right. If you think the seal hunt is the epitome of egregious eradication and extinction (lots of Es, eh?) then you haven’t heard about the wild-goose chase, literally, going on in New York City. It seems Mayor Bloomberg has a mad-on for mallards and has authorized the slaughter of all Canadian geese within a five mile radius of JFK and La Guardia airports. 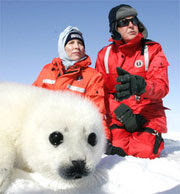 And you thought the seal hunt was a senseless slaughter? Federal Agricultural employees are expected to round up something in the area of 2,000 Canada geese and exterminate them using carbon monoxide. Yep, that’s right, the geese will be taken to a so-called “euthanasia center”, likely Mayor Bloomberg’s running limousine in the city hall garage. What? Isn’t that the most common method of death by carbon monoxide? I don’t know what the feds intend to do with the carcasses, but unlike seal meat the geese won’t be used for human consumption. Hey, what about the homeless. They’ve gotta eat too! As a Canadian who has suffered the rhetorical slings and arrows associated with the annual seal hunt it’s nice to see Americans getting a similar drubbing over, of all things, geese round-ups. But the round-ups (nice spin – sounds better than “bird kill”) aren’t the only approach. The city plans to post signs banning bird feeding in parks, and the Port Authority is expanding shotgun training of airport employees. Just what we need: surly airport employees with shotguns, trained to shoot to kill bird feeders! You know, some might think this story to be a canard (ha, ha) but it is neither false nor about ducks. But it does remind me of the expression “It’s hard to fly like an eagle, when you keep getting sucked into a jet engine”! Interesting that only the Canadian geese are getting sucked into jet engines, not the American ones. Just a casual observance. PS - You have won a caption award on my blog. Please come get it ASAP since it's cluttering up my foyer. Doug: Nope just Canadian geese - it's a conspiracy. P.S. I collected my award. Glad you thought I submitted the "least crappiest caption". 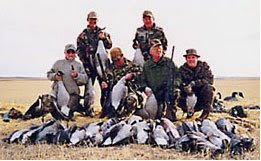 Wow...I can see how you can compare the seal kill to the goose hunt. I had NO idea seals were randomly throwing themselves into the paths of sled dogs and snowmobiles...risking the lives of untold numbers of a single person. THEY MUST BE STOPPED!! STOP THE CARNAGE!! If not, I'm opening one. moooooog35: Ha, ha, good one - not sure, but for over-imbibers how about one called The Duck Blind?